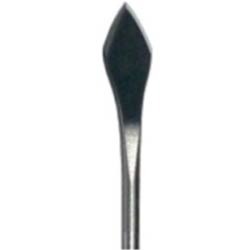 We have gained expertise in manufacturing and offering a range of Ophthalmic Surgical Knives & Blades. All our products are developed by a team of adroit experts, following industry laid norms and guidelines. 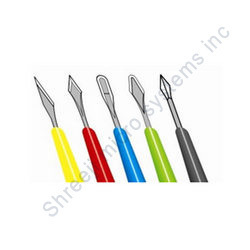 These heat tampered knives are designed to offer strong and accurate point for easy penetration during surgeries. Due to sharp edges and rustproof nature, our offered knives & blades are widely demanded by the clients. 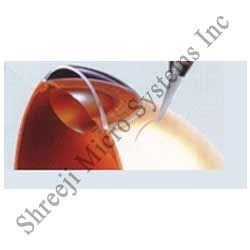 Our enterprise specializes in offering qualitative range of Keratome Slit Blades. All our products are developed under the supervision of experienced quality controllers as per international norms. 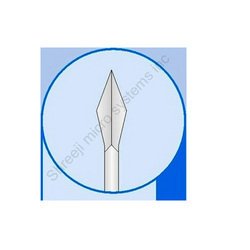 Designed to provide incision of required width for IOL implant, these are widely appreciated by the clients for their rustproof nature and seamless finishing. The tips of these blades are made blunt to avoid secondary incision. Moreover, patrons can avail these blades from us in different lengths and specifications. Supported by a modernized infrastructure facility, we have been able to come up with a gamut of Ophthalmic Blades. These are made using supreme quality raw material that are sourced from reliable vendors of the market. The products offered by us find their use in various hospitals and nursing homes for surgeries. Owing to resistance against corrosion, sharp edges, fine finishing and durability, our offered blades are widely applauded by the customers. We manufacture wide varieties of Keratome Blades, which are designed to give incision of required width for IOL Implant. Their tip is made blunt to avoid secondary incision. We offer these in various lengths. 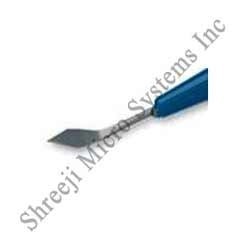 Ophthalmic micro surgical knife: keratome blades with full handled eto. 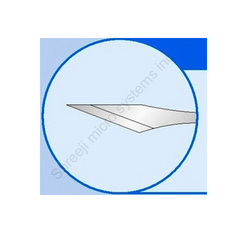 Ophthalmic micro surgical knife: Stab incision /side port blades with full handled eto. 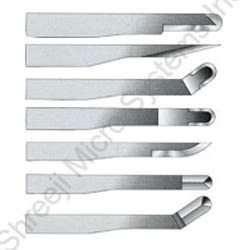 Ophthalmic micro surgical knife MVR-side incisionblades with full handled etc. 45 angled full handled high sharp cutting edge.